To those who catch the vision of God and fulfill the work and will of God; the remnant, there are promises of abundant harvest. You will not even finish threshing out the harvest until the next harvest is upon you. This is why the need for laborers is so urgent. The plowman is overtaking the reaper. The vision of the harvest is before you. 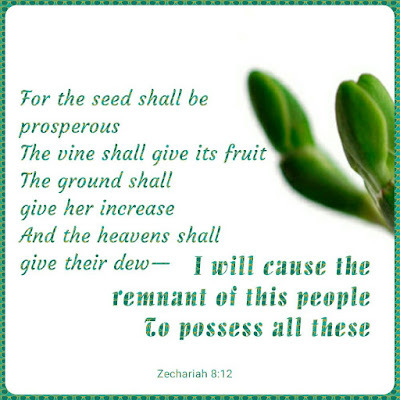 Claim the promise of abundant harvest. Claim the heathen for your inheritance. The fields of the world are before you. Lift up your eyes and look. From all over this world the procession will come. From Africa, Australia, Asia, North and South America, Europe, and the Islands of the Sea... Harvesters streaming into the throne room of God. Men and women who have made the vision a reality...Those who lived with the vision as central to their reason for being... Those who died embracing its promises.